This quote shows that competitive balance has been crucial for 2,500 years. Made following the ostracism of Hermodorus, it describes how ancient Ephresians exiled any competitor in a contest who they felt was too dominant, preserving interest in the contest. The issue of competitive balance has often been brought up with regards to the Premier League. The money involved, particularly through participation in the Champions League, has been accused of making the Premier League relatively uncompetitive, and as a result, slightly boring at times. The same teams tend to dominate at the top of the league and the same teams struggle season after season to hang onto their treasured place in the division. So, has the competitive nature of the Premier League declined since its inception due to the growing gap between itself and the Championship? Has it declined within the league as the Champions League clubs move ahead into their own virtual mini-league? First of all, let us clarify what we mean by competitive balance. 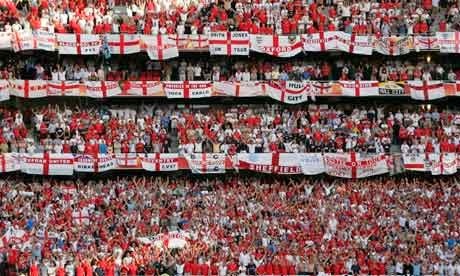 If there is considerable uncertainty concerning the outcome of a sporting contest or league competition, we would say there is high competitive balance. 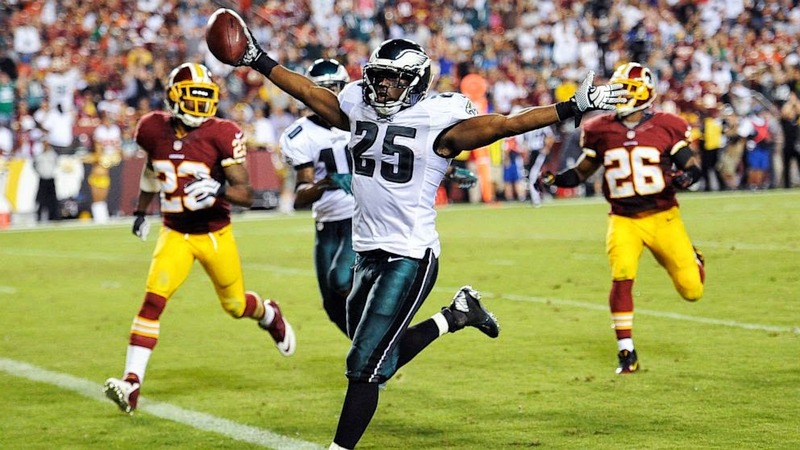 It is a relative measure of sporting abilities across teams in competitions. There are two types of competitive balance. Static competitive balance looks at within-season competitive nature of a league. It focuses on whether sides are evenly matched, leading to closely-fought tournaments or whether there are large differences, leading to runaway leaders and sides adrift at the bottom. Dynamic competitive balance looks at competition over longer periods, focussing on whether sides consistently occupy the same positions in the league. So, how can we measure competitive balance? We shall borrow two methods from economics – the Null-Scully value and the Spearman Rank Coefficient. where σ(wp)ideal is equal to 0.5/√N. σ(wp)it represents the standard deviation of winning percentages within league i during period t, and N represents the number of games. The standard deviation of an ideal season takes this form because the standard deviation of a random selection of an individual team’s wins follows a binomial distribution (N,p) where N is the number of games played and p is the probability of winning. In a perfectly competitive league, p would be 0.5; hence we get the expression for the standard deviation in a perfectly competitive league. In a perfectly competitive league, the Noll-Scully value would be one, since the two standard deviations would be equal. This value must always be greater than one, since the standard deviation in any competition cannot be lower than that in a perfectly competitive league. The closer to one, the more competitive the league. The measure for dynamic competitive balance is the Spearman rank correlation coefficient. This looks at correlation between finishing positions of clubs in consecutive seasons. In a perfectly competitive league, there should be no correlation between where clubs finish in one season and where they finish in the following season. As the league gets less competitive, the Spearman value moves further from zero, either positively or negatively. In many cases, teams that do well in one season do better the following season, so we would expect it to become more positive. where di is the difference in rank for team i between the current season and the previous season, and n is the number of teams. In a perfectly uncompetitive league, every side will finish in the same position as the previous year, d will equal zero, and therefore the Spearman’s coefficient will be 1. As it becomes more competitive, this moves toward zero. Obviously, the Premier League has a relegation system, where the bottom three clubs are demoted to the Championship, while three teams are promoted into the league to take their place. To deal with this across seasons, the team that wins the Championship will be treated as equal to the team that finished 18th in the Premier League, the team that finished 2nd would correspond to the Premier League's 19th placed team, while the Playoff winner will correspond to the bottom team in the Premier League. As I stated earlier, a perfectly competitive league would have a Noll-Scully value of 0.5. Clearly the Premier League is far from a perfectly competitive league, but every league in every sport in the world has certainly levels of imbalance. 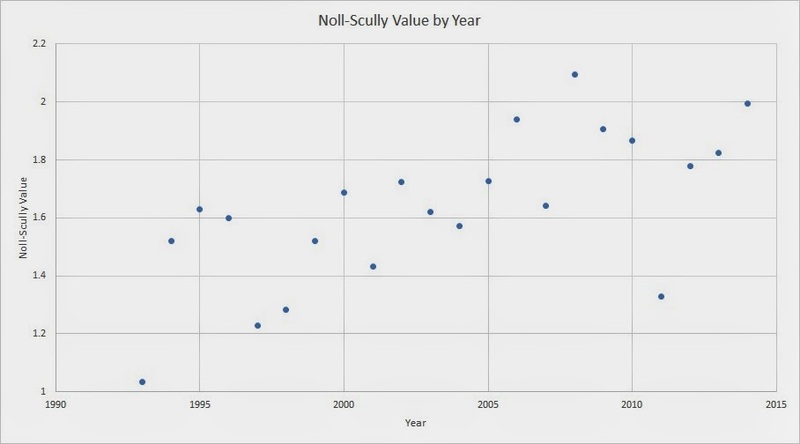 However, we can see a steady upward trend in the Noll-Scully value since the inception of the Premier League in 1992. The first season saw a N-S value of 1.04, but ever since then, it has followed a relatively constant increase with the exception of the 2010/11 season, which saw a surprisingly low value. So, the 2013/14 season that recently finished saw a N-S value of 1.99, but how does this compare with other competitions? In the National Hockey League (NHL) in America, the average N-S value during the 2000s was 1.73. For the National Football League (NFL), we find a value of 1.57, while the National Basketball Association (NBA), the value is just below 3.0. We can conclude that the English Premier League has a greater static competitive balance than the NBA, but less than both the NHL and NFL. The concern might be the trend in the static competitive balance though. As stated earlier, a perfectly dynamically competitive league would have a Spearman value of 0. A perfectly uncompetitive league where every team always finishes in the same position would have a value of 1. We can see that the Spearman coefficient dramatically increased in the years immediately following the inception of the Premier League. The drop following the 1999/2000 season marks the point where the number of English teams in the Champions League increased from two to three, then four. There was slightly more competition around this period as additional teams gained the opportunity to benefit from the riches of the Champions League, but once the Big 4 teams were established, the Spearman coefficient returned to its upward trajectory. It is too soon to draw any clear conclusions, but the drop in the Spearman coefficient this season might be linked to the increased television money in the Premier League increasing competitive balance within the league as other teams can afford transfer fees to bring in new stars, but it could just as easily be dominated by the effect of Manchester United dropping from 1st to 7th following the departure of Sir Alex Ferguson and Liverpool's unexpected title challenge. The coming seasons should help us to understand this more. Again, how does this compare with other competitions? In the NHL, the Spearman value tends to fluctuate between 0.4 and 0.6, in the NFL, it is between 0.2 and 0.3 and in the NBA, it is around 0.6. Thus, the Premier League has incredibly high levels of dynamic competitive imbalance. Teams tend to finish in the same position from season-to-season with very little real change. There may be some variety in terms of how far apart all the teams in the division are, but in terms of where they actually finish, there is very little difference. This roughly corresponds with what we expected to find. The top teams are financially far superior to the rest of the league, meaning that they rarely drop out of the top grouping. Even within that top group, there is a fairly strong pecking order. For the majority of recent seasons, Manchester City, Manchester United and Chelsea have battled for the title. Arsenal have finished 4th, while Tottenham, Liverpool and Everton battle it out for the 5th-7th placings. The growing gap financially between the Premier League and the Championship means that teams often struggle when they come into the league, while the same group of teams tend to either just stay up or finish in a comfortable mid-table position come the end of the season. This is where the Premier League may struggle in the future. The steady rise in the Noll-Scully value shows that the gap between the top and bottom of the league is growing almost year-on-year, which combined with the Spearman coefficient, means that the league is becoming more and more hierarchical. If this continues, people will start to lose interest in the league. Fans always maintain that hope that their club can break into the higher levels over time. If this hope is diminished, the interest in watching the sport might begin to decline. Is there hope that things might change? Sadly, it would appear not. 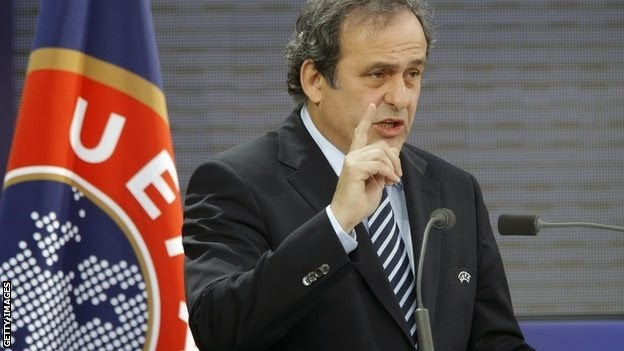 The new UEFA Financial Fair Play regulations will act to reduce competitive balance further by artificially imposing different budgets on teams. The top teams already have greater revenues, so they can spend more money. Smaller clubs will no longer be able to speculate to accumulate. Without more considered interference from either the Premier League or from UEFA, it is tough to see how these trends can be halted or even reversed. The financial aspect of football means that the top clubs get richer and richer at a far higher rate than the rest of the league. Thus, it is likely that competitive balance will continue to fall over the coming years. How did you calculate Spearmans Rank - if teams get relegated how did you take this into account? I feel truly cheerful to have seen your website page and anticipate such a large number of all the more engaging circumstances perusing here. Much appreciated again for every one of the points of interest.